Many moons ago, I cooked up my first batch of apple butter. It was surprisingly simple and tasted better than anything I had growing up; and from what I remember, the jars my mom would bring home tasted pretty darn amazing! 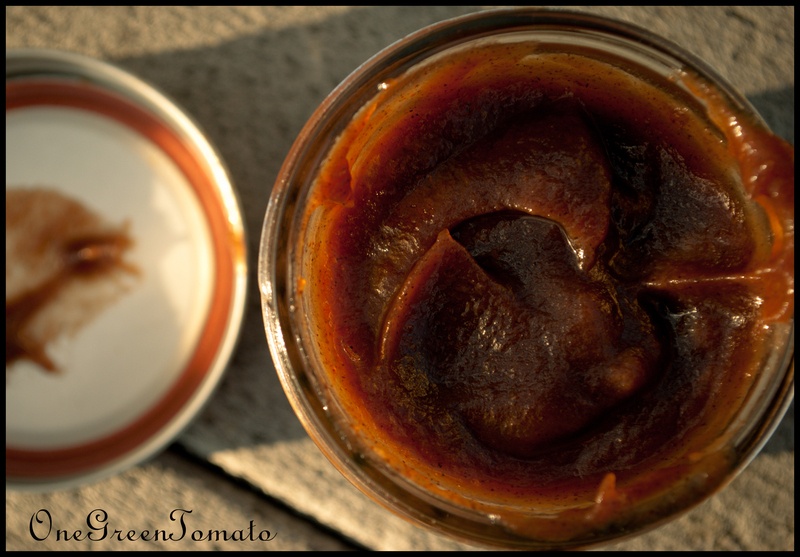 This no-fail low-maintenance method is my constant go-to when making apple butter. It is so easy you’ll wonder why anyone would choose a different route! If you want to make apple butter, the first thing you need to do is make applesauce: read – a perfect recipe for putting up during the off-season! The directions for unsweetened applesauce are in the beginning of the linked recipe; although, I highly encourage anyone who loves vanilla and maple to make the “awesome sauce”. Trust me, you will not be disappointed! When apples come into season this year, I’m making a batch of vanilla-maple apple butter! Place 6 qts of applesauce in your slow-cooker (or however much fills it to within 1-inch of the rim), add the spices and 2 cups of sugar; mix well. Set heat to high and cook for an hour with the lid vented; resting the lid on a long wooden spoon works well. Reduce the heat to low and allow to continue cooking for an additional 8-10 hours. Once the mixture has been reduced by half, add the remaining applesauce and sugar. Stir and cook several more hours allowing the flavors to mix. When the apple butter has reached your desired thickness, using an immersion blender, purée mixture into a creamy consistency. Ladle into hot, sterilized, half-pint jars and remove air bubbles; wipe rims, add two-piece lids and process in a boiling-water bath for 10 minutes, or for as long as your altitude requires. Images and content copyright © 2013 Danielle R Limoge. Recipe courtesy of PickYourOwn.org.